Nigerian born and raised, Ayotade brings over 20 years of HR and telecoms industry experience to the IHS management team. Ayotade most recently served as Millicom Services UK Head of HR for Africa and Europe, overseeing operations throughout Africa, as well as the corporate offices in London, Luxembourg and Sweden. He also has extensive experience in driving international and African talent acquisition and development at various executive and operational levels within the telecoms sector. 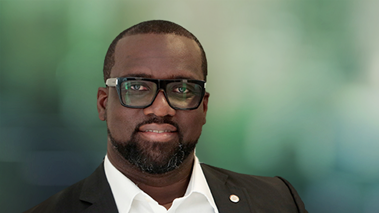 Previously, he served as Ericsson’s West Africa HR Director and the Sub-Sahara Africa Director for Learning and Development. In addition, Ayotade has held a number of senior positions at Shell Petroleum, Bristow Helicopters, Atlasco Technologies and Resourcery Limited. Ayotade holds a Bachelor of Engineering degree (Electrical & Computer Engineering) from the Federal University of Technology, Minna; an Executive MBA (Strategy, Human & Organisational Behaviour and Strategic HR) from the Lagos Business School; a diploma in Entrepreneurship from the IESE Business School, Barcelona; Executive Leadership Development diplomas from Harvard Business School and the Wharton Business School; a Leadership and Public Policy diploma from the Harvard Kennedy School; a certificate in Strategic Human Resources from University of Cornell’s School of Industrial and Labour Relations, and a Talent Management diploma from the Stanford Graduate School of Business.